Your free report is on the way! Please check your email for it shortly, and enjoy. Watch the short preview of the show to see what it's all about. I have been teaching for 15 years and can honestly say that after watching his show I became more motivated and instantly incorporated some of his techniques into my everyday teaching. this fun yet practical arts-in-education assembly! Brad prepares to memorize decks of cards for one hour at the 2012 World Memory Championships in London. He accomplished 9 decks perfectly; in 2013 he memorized 11.5, and in 2014 he memorized 13 decks in one hour. Receive a free report with tips to improve your child's memory, along with two free chapters of Unlock Your Amazing Memory. Brad with medals from one of the USA competitions. Brad's memory hasn't always been amazing. In school he did poorly at math and science: those subject just didn't seem to stick in his mind. As an adult, remembering names was always difficult. In 2008 he decided to see if an ordinary person could actually improve his ability to remember. He discovered that memory improvement is possible, and it can even be easy and fun. Brad has competed at memory competitions around the world since 2009. In 2012 he received two bronze medals at one competition in the United States. At the 2013 World Memory Championship in England, he set a new American record for memorizing spoken numbers. In 2014 at the World Memory Championships in China, he broke his own record for spoken numbers. Brad Zupp has been a professional entertainer since age 12 (30+ years). At age 17 he was accepted to the prestigious Ringling Brothers and Barnum & Bailey Circus Clown College, where he learned the fine art of comedy, juggling, stilt walking, pie throwing, elephant riding and more. Upon graduation, Brad joined the Greatest Show on Earth and performed as a clown, juggler and stilt walker with the circus for two years. Since those early years, he has travelled around the world, performing on cruise ships, at theme parks, corporate events, and hundreds of schools. In 1991 he used memory techniques to learn Japanese while performing in Japan. Brad memorizing a deck of shuffled playing cards at the World Memory Championships, wearing noise canceling headphones and a custom-made eye mask to block out distractions. His current personal best at memorizing a deck of cards: 58 seconds in training, 85 seconds in competition. He continues to train daily, and is passionate about helping people learn to remember better. He has performed at hundreds of schools and corporations, helping tens of thousands learn how memory works. Cool under the pressure of television cameras filming at a competition in the United States. Memorizing names and faces at the World Memory Championships 2014 in China. Preparing to memorize 13 decks of shuffled playing cards in one hour in China. Memorizing 13 decks of cards in one hour at the World Memory Championships in China, 2014. Brad broke his own record set the previous year (112 digits) by memorizing 150 digits spoken by a computer at the rate of one per second, without ever seeing the numbers, writing them down, or reviewing them. 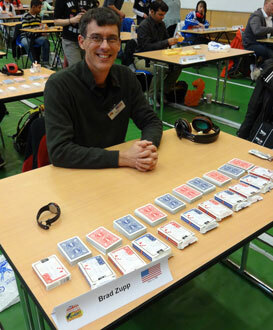 Brad has helped the USA to three top 10 finishes at the World Memory Championships, including 5th place (the highest ever for the USA) in 2012 and 2013. Click here for the contact form to have your questions answered.